who doesn’t think of pumpkin pie when the holidays are closing in!? i love the idea of making these little pumpkin pie bites, found over at Louanne’s Kitchen. for some reason, eating a full-sized pumpkin pie before thanksgiving seems a bit illegal, but pumpkin pie bites? totally allowable. great idea for bringing to the neighbor’s, too, without having to bake 8 whole pies! 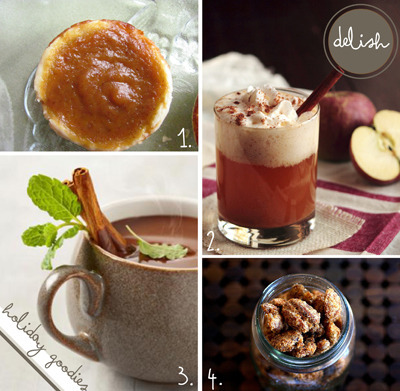 caramel apple cider. just having it simmer on the stove will instantly transport your whole home into the middle of a martha stewart-esque holiday wonderland! but drinking it is even better. and maybe a splash of tito’s vodka after 5pm?!? alright…pastry affair has a pretty legit looking recipe that i’m gonna hafta try! if we’re finishing the day off with spiked cider, let’s start it off with peppermint mocha coffee. it makes for a pretty lavish day of beverages…which i’m into. shape magazine has a skinny peppermint mocha recipe that i will absolutely test out. that way i can have two! we made candied nuts for gifts last year, and they came out great! i wish i had made billy dictate the recipe to me as he did it, but this step-by-step from smitten kitchen should do the trick! not to mention they throw in a bit of hot smoked paprika, which i am definitely adding to our to-do!